Isn’t it amazing how you the architectural bones of a house can really guide it through its design journey? I first came across the Libbey Ranch years ago while watching an episode of Million Dollar Decorators (ambitious viewing for the likes of me, I’ll admit). Back then, LA-based interior designer Kathryn Ireland had just completed the task of bringing the house back from a state of decrepitude. 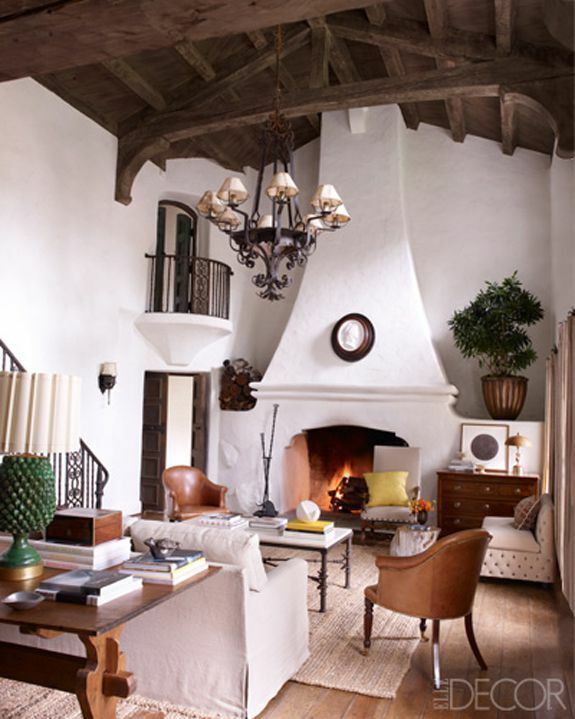 She found a way to celebrate the 1923 Spanish Colonial architecture of the ranch while making it function for the modern family. Kathryn documented the transformation in her book Creating a Home. I actually own it, along with all of Kathryn’s other books and I find them hugely inspiring to flick through. She certainly had the “approachable, friendly design” approach down pat. Not long after first discovering the ranch, I was surprised to see it again in Elle Décor with none other than Reese Witherspoon herself frolicking around. The interior had been stripped of Kathryn’s signature Mexican cheerfulness and replaced with more formal equestrian-inspired furnishings that were reminiscent of the English countryside. It would seem that all of the furniture used throughout the home are either custom-designed or high-end antiques. However, the jute rug is from Pottery Barn- the affordable American homeware chain. The product credits from this project are high-end, but don't let that intimidate you. There are always ideas you can take from a space like this and apply to your own home on a smaller budget. For example, you could replicate this simple sideboard display using your own lamp, artwork and bowls. One of my favourite things about this home is that there are so many different seating areas. Some for solitary reading, some for sociable lounging, some for working and some just for putting on your shoes. How cosy is this room?! The set-up under the stairs is a good example of how Kristen used a range of designs from around the world in each corner of the project, The mahogany desk is from Lars Bolander, the chair is a 1920s Swedish design and the stool, 19th century Spanish. On top of it sits a handmade Indian blanket. Around the Directoire dining table sits an assortment of chairs; some custom-made for the space and some from 1760s Sweden. Perks of being an Oscar-winner, eh?! This kitchen design is simple and practical and could be easily replicated. The key to warming up an all-white kitchen is to add in rustic accessories. In this case; over-sized bread boards, wooden bowls, a produce basket and a pair of industrial bar stools. Add a luxe touch to your bathroom by adding a chair, a more formal mirror and stools to keep some of your favourite projects at easy reach. The mis-match of texiles in the kids' rooms add colour and fun to the space while also representing the Spanish style of the build. Reese is pictured her with her two nieces, Draper and Abby James. The girls were the namesake for Reese's own homeware and lifestyle brand, Draper James.